Yes, another down day. Down 20% today. However the good news is… the PPS is still up 11% from the big crash Monday and Tuesday. AND… still up a little over 100% from where we began the month. So, if you’re an investor, and you’re feeling a little down because the PPS is not over a penny and a half… think about the 100% increase from where we started the month at. Is the PPS where we think it should be… NO… but we will take a 100% increase for the month any day ! If you are invested in any other stock, can you say its up over 100% for the month ??? Why didn’t the PPS go up today, given that the 10-K is scheduled for release tomorrow, AND the CEO has indicated its the best he’s ever worked on??? We think its simple market forces at work. A) many investors will not hold investments through earnings (i.e. release of 10-K). They have rules, and they stick to them. Not a bad idea in our opinion. B) its a long weekend… many investors will not hold investments through a long weekend. C) Remember… the PPS is up over 100% MTD. If any investors bought in when the PPS was near the low of .0032… they are up over 100%. Good time to sell even IF points A and B were not present. D) with all of the above present, why take a chance investors will not “sell the news” as is commonly done. Investors can always buy it back Monday morning first thing if conditions are ripe to make another 100% on their money next month. OK, so they may have to pay a little more Monday morning, but its likely to still be under a penny, and still a great buy under, at, or a little over a penny. If you follow the message boards, you will see there is no shortage of opinions on what kept the PPS from shooting up today. Everything from “shorties drove it down”, and “bashers drove it down”, to evil Marker Makers conspiring to manipulate the PPS. While all of the above together, in some form or degree, could have contributed to the decline today… we still feel its simple market forces at work being the primary reason. Those of us who are passionate about the company, are frustrated that other investors do not share our enthusiasm and therefore have not bought up the stock. We just need to keep in mind that some investors are only in this thing for the money. Some of those could care less if the company does well, or shuts down… they just do whatever it takes to make a buck (i.e short it, flip it, whatever). Whereas others are invested in THE COMPANY. They think the company will do well and make them a lot of money in the long run, and are willing to wait patiently for that to happen. They enjoy the excitement of being part of something. They will likely take some profits along the way up, but for the most part will likely be invested for years. And you know what… BOTH are right ! As investors we do what’s best for us. Not everybody likes vanilla flavored ice cream. In fact, some don’t even like ice cream of any flavor ! So… enjoy your long weekend… and Monday is another day. If you have your health, you are rich everyday ! Correction completed… PNCH up 31% today ! Well folks… it appears its safe to go back in the water. The PPS started back up this morning first thing, and gained a respectable 31% by close, on 17-million shares traded. Tomorrow should see additional gains also. Remember, tomorrow (Thursday) will likely be the last trading day before the release of the 10-K, which is scheduled to be released on Friday. The market is closed this Friday. We will leave you this evening with a reminder of Steve’s quote… “the best K I have ever worked on.“. We like the sound of that !!! Another (big) down day ! WOW… today caught us off guard. PNCH down 49%. We can’t explain it, other than to say there was panic selling triggered by who knows what. The PPS recovered to close at .0061, which is still almost 100% above where we began the month at… but today’s loss still stings. Tomorrow is another day, and we are optimistic that the PPS will recover, hopefully somewhere near Friday’s close of .015. There was some good news posted by the CEO today which stated he was working on the “the best K I have ever worked on.“. We like the sound of that !!! What a WILD ride today was ! WOW… what a day ! PNCH gapped up this morning at open, then about 1.5 hours later crashed hard down to a low of .007. That was a huge drop in the span of about 20 minutes. It did start the recovery process about 11:45a, and the recovery took place over the span of about 45 minutes. The stock stayed fairly flat the rest of the afternoon, closing at .012, for a 20% down day. This is not what we expected to happen today ! We are not worried ! This volatility has to be expected in penny stocks. That’s part of what makes them exciting, right ! The movers and shakers of the market makers needed to shake lose some shares, and we suspect this move today did the trick… lol. Everyone is positioning for the 10-K release later this week… most likely Friday when the market is closed, and we suspect those holding any shares short needed to cover before what may be a big move upward if the news is good. Certainly the flippers who bought in before the huge increase over the last 2 weeks were happy to take some profit today also. So… everyone but the “longs” probably made some money today, however as longs we are not worried because the overall direction is up. Remember, the trend is your friend ! And the trend with PNCH is still up, with the best news yet to come. Today’s wild ride was not for the faint of heart, but all in all, just a blip on the screen of a great company ! In closing today we want to extend a special thanks to “SLICKRIC50” who is a MOD over on the Investors Hangout PNCH board. He is keeping an eye on this blog and sets us straight in the proofreading area. Thanks RIC… your efforts are appreciated ! As always, please feel free to comments on this, or any, post here, by clicking the “Leave a Comment” link at the top right of any post. You may also leave your email address below if you would like to be notified when a new post is posted here. And, feel free to visit our website for more valuable information about PNCH, and anything PNCH associated (such as new article on LieHub, which will be posted soon). After a quick peek over on LieHub I see that the bashers have wiped their tears away and caught a second breath. They are back at it again… just like a rash you can never seem to kick. The bashers are just pathetic at their efforts to smear PNCH and anyone affiliated with PNCH. They will stop at nothing in their efforts to bring down the company… including lies, repetition of old lies, repetition of older lies, fabrications of unsupported accusations and distortions of truthful data. We all wonder what skeletons are in their closets, but who really cares about these idiots… their motives are glaringly evident. But, here is the positive benefit of their shameful actions… for every bashing post on what is the most deceitful message board of all time… there are 5 to10 positive posts demonstrating the trash they post is just that… trash. (we offer a big Thank You to those that consistently fight the basher’s futile efforts). Its apparent they are now desperate given the increase in PPS of late. Their efforts were effective early on, but now they have become irrelevant. PNCH’s growth cannot be stopped ! An example of how transparent the bashers efforts are… there is one basher over there that tells so many lies he/she/it can’t keep them straight. Months ago they posted they lost big on their investment, so they got out (hence the spewing of venom). Then they said they were flipping the stock to gain back some of their loss. Then they were saying they were shorting the stock (even while the PPS was raising… lol). Then of late they say they are making a “ton” of money on the stock by buying the dips and selling the highs. Yet they continue to bash the stock and CEO by telling readers that the company is a POS. So, let us get this straight… the pathetic basher buys the stock then proceeds to bash it even though in order for his investment to make money he needs to have an increasing PPS to make any money. Also, on days when volume was low, the basher states he made an amount of money that day that was mathematically impossible to make. You can’t make this stuff up folks. There is an old saying… if you think everyone in the world is stupid… then maybe its you that is the stupid one. I suspect the basher seriously thinks readers are so stupid that they believe the lies he posts. Look up the definition of pathetic in the dictionary and you will find this basher’s picture. Bashers can be effective on weak companies, or companies with inexperienced investors, however with PNCH, it’s a strong company with a viable product and a niche market, and a dedicated management team, as well as intelligent investors. Intelligent because they are able to do their own Due Diligence and determine the potential of this company. Bashing will no longer hold this company back, as the long time investors are more influenced by real DD over unsupported trash posted by disgruntled bad investors that could not see the potential, and sold too early, for a loss. The bashers made a stupid move and now they are looking for someone to blame for their stupidity. Our suggestion… look in the mirror and they will find the source of all their problems. A gain of 7.14% today… we’ll take it ! We had a bit of a gap-down this morning, but we recovered nicely to close at .015. Looks like the steady increase leading up to the release of the K report at the end of the month is still intact. Go PNCH ! Tomorrow should be an exciting day. Investors will be positioning for next week. Hopefully the YTD K report will be released before next week ends. And, just maybe we may see it early. Who knows, Steve has released filings early before… he just may do it again. So ask yourself this… IF you want to be a PNCH investor… do you want to be an investor Before, or After, the report is released. All speculation points to this report being really good. Yes, you will be able to buy (or buy more) after the report is released… but at what price. We think… the sale prices will end either tomorrow, or early next week. YOU make the call ! In closing, here is something that was posted on Investors Hangout today. We liked it, so we are posting it here also in case you missed it. Other than the questionable spelling of “Thursty”, we thought it was a classy poster. No one seems to know if the spelling was intentional or not… whatever, we get the point ! A RED day… oh no ! Yes, its true, the bashers can now say the bull run is over for PNCH. LOL… closed down today 1.4% (.0002). Oh my… the sky is falling, run for cover ! Really folks… this was actually a good day for PNCH. We tested a High-of-day (HOD) of .0161, that’s a good thing. We had a swing today from .0131 to .0161, settling in at the end of day at .014 on almost 7-million shares traded. Remember… this recent activity is in preparation for the [expected] good news being reported on 3/29 when the year-end report is released. However, keep in mind that the shareholder meeting is being held shortly thereafter (see here)… and then not long after that the 1st. quarter results will be reported. We think… if you like what you see on the YTD reporting, you will love what you may see on the 1st. quarter report. Keep in mind that as time moves forward, so does PNCH. We anticipate better and better quarterly reports from here on out. PNCH is growing like gangbusters and the revenue will show it. And finally… we wanted to leave you with this tweet that was posted today. We think its one of the greatest tweets (and slogans) we have seen in quite a while. Although the link in the tweet does not link you to the PunchTV site, (we think) it should have. 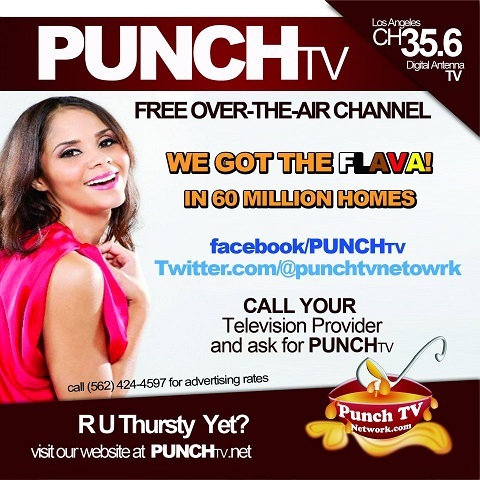 So here is the link to the PunchTV “How to Invest in Punch TV” page. Looking forward to an exciting day tomorrow and Friday. Tremendous day for PNCH ! The best aspect of this run-up is… the bashers have all but disappeared. I guess they just can’t fight the truth of the recent history ! The chart proves everything they have been saying as wrong. Many said their day would come… and we believe it has ! Of course there are many who have arrived on the scene predicting advances into 5-cents, 10-cents-25-cents and so on. Many more who have said they have been holding all this time are now showing up on the scene saying they have been “longs” all this time, but just haven’t been posting. OK, that could be possible, we will let you be the judge. No matter though, even if they did nothing to support the company during the time it needed it most, they are still able to buy into (opps, we mean cash in) on the great progress the company and stock have made recently. What does the future hold for PNCH… who knows. Anybody that boasts they know, are simply guessing. If they really knew, they would be working for some large hedge fund or brokerage house making a ton of money, not playing penny stocks. Our thoughts are, if you’re in, stay in, and ride the wave till it gets near the beach. If you’re still thinking about getting in, or getting in deeper… do your DD and we think you will find your answers there. A good place to start is our website. There you will find a lot of good information to get you started. Again, expect pullbacks along the way up. Flippers are in and out often causing downward spikes. Today the PPS ran up to .0149, then backed off substantially, only to return to close at almost the high of the day. Don’t be fooled by these pullbacks. Remember… the trend is your friend ! And the trend (right now) is UP ! If you’re a shareholder, do whatever you can to tell others about the company. Tweet, post it on your Facebook page (ours is here by the way, although not very active with it), message boards, email, whatever. We think the company is doing great things and is making huge progress at being a bigger and better company every day. When the company gets bigger and better… so does the PPS. When the PPS grows… investors make money. That’s it for today. We can’t wait to see what PNCH holds for us tomorrow, and in the future. This sure is exciting ! WOW… up another 15% today !!! If you have been following PNCH for the past year, you know how exciting this news is. The increasing PPS if great news for all those that have seen their portfolios red for quite a while. We suspect that for those accounts that have been red for a while, they are likely green now, or getting real close to green. Those that have been with PNCH for a year or longer, and have hung in there through the 2012 downturn, are extremely hopeful that this run (which started in late February) will continue. We believe PNCH is simply finding its rightful value and will continue to rise for the fordable future. Remember, the K and Q reports are due out starting around 3/29, then there is the shareholders meeting 4/13. We are hopeful there will be some exciting news released in this meeting with shareholders. For details on the shareholders meeting, click here. Tomorrow will be another exciting day for PNCH. It has broken through the 200 MDA, closing at .0104. 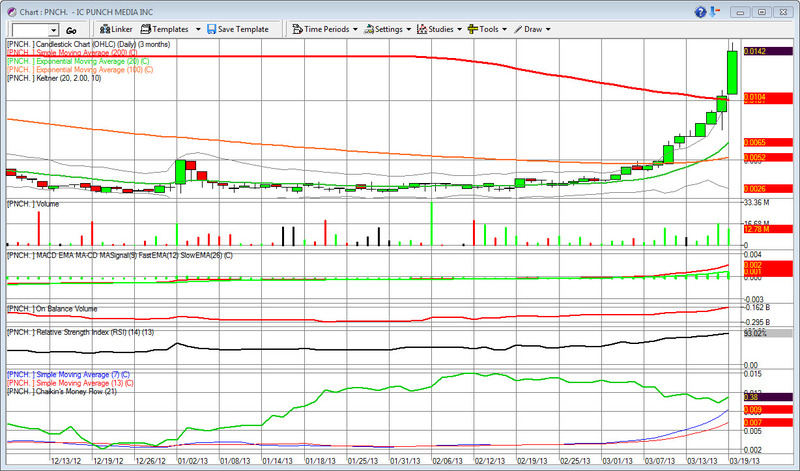 The MDA was at .0102, so not only did PNCH break through, it closed above it. PNCH did have a mid-day pullback to .008, and this of course likely shook out some weaker hands and flippers, but it recovered in a big way to close at the .0104, for a 15.56% daily increase. If you bought in at or near the bottom (in the .002’s) you are smiling ear to ear at this recent performance. We are confident, but still excited, to see what tomorrow holds. Hopefully more of what we have had since late February ! PNCH up another 11% today ! WOW… this pennystock is breaking all the molds. That’s 7 days straight up (well, one of those it was even). And remember, this run started at .0028. Looks like its almost certainly headed for pennyland next week. The 200 day moving average (MDA) is .0102. If it breaks through that milestone… as they say, the sky is the limit ! Its funny… the bashers over on LieHub are all but silent. We think in the game of keeping score, they lost. Its also too funny, one of the most prolific bashers over there is now posting he is making money on the stock. Yea, right. How does one consistently bash a stock relentlessly and be buying it all along. No fool buys a stock then bashes it, unless of course they shorted the stock, and that is unlikely. See why here, and here. Most working folk dread Monday’s… however, if you’re invested in PNCH, you probably can’t wait for Monday to see what the stock will do next week. Should be a VERY exciting week. We think next week could be the week PNCH gets back over a penny. From there, hold on, it will an “E” ticket ride !